In many ways, the reason Chrono Cross is one of the most underrated JRPGs in gaming is because of the comparisons to its predecessor, Chrono Trigger. Chrono Cross is a somber and meditational work, exploring destiny, fate, and decisions in a way that is more philosophical in nature than Trigger. Cross lacks the quirky humor that Dragon Quest’s Yuji Horii usually brings as well as Akira Toriyama’s anime aesthetic (who was replaced by Nobuteru Yuki). Instead, Cross gives us a complex pair of worlds connected by the Angelus Errare (“where angels lose their way”). 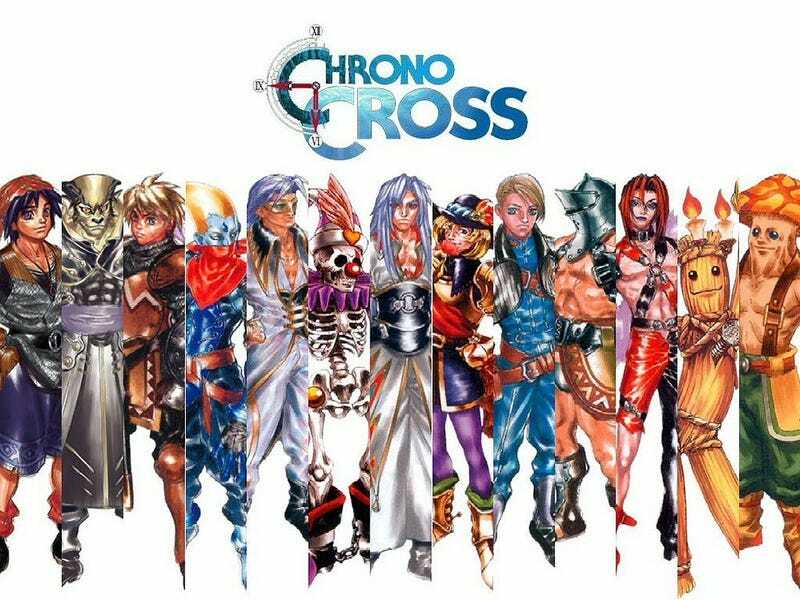 You need to not only shed expectations, but almost put aside Chrono Trigger entirely to appreciate what an incredible feat Cross is. At the same time, there is clearly a connection and it’s the ways the games intersect that prove both challenging and disturbing for players who picked up Cross expecting a traditional sequel. The main characters of Chrono Trigger meet mostly tragic ends. Crono and Marle got married, but it’s implied the Kingdom of Guardia is no longer peaceful and events took a violent turn shortly after the original game. Robo appears as the Prometheus circuit, but gets killed by FATE. The underlying story revolves around the fate of Schala, the princess from the sky utopia of Zeal, who got fused into Lavos. Her brother, Magus, was supposed to be a recruitable character, but got cut in favor of Guile. Lucca raised one of the main characters, Kid, at an orphanage until she was killed by the main villain, Lynx. But, in a strange twist, Kid is actually the daughter-clone of Princess Schala. Destiny has not been kind to Trigger’s characters. Chrono Cross isn’t a continuation of their story. Rather, it’s about an entirely new character named Serge who grew up in a fishing village in a different part of the same world. In Serge’s normal timeline, he’s alive and well. But in the other parallel universe into which he’s sucked, he died at sea. That’s where the game splits into two unique tracks. Whereas Trigger focuses on exploring the separate epochs in time, a big part of the genius of Cross is exploring the dual alternate realities, traveling between both to get an idea of the intertwined paths that bind the histories together and learning what the differences are as well. I think one of the aspects I didn’t like the first time through Chrono Cross was that I didn’t feel the characters were as rich or interesting as the ones in Chrono Trigger. The team behind Chrono Cross originally wanted every character in the world to be recruitable and have their own story. That proved to be too difficult to manage just by sheer scope. That eventually became 64 characters, each with a unique ending. That sum was decreased to 45 as were the number of endings to make it more manageable. What’s important to note is that Cross wasn’t trying to recreate the closer, more intimate adventure of Trigger. Cross was about a huge cast of characters and the implications of their existence, how one death, or life, impacts the universe around them. If a character like Frog were in Cross, in one of the worlds, he’d be a human Glen and the other, the same warrior we know and love. The story wouldn’t focus so much on Glen’s relationship with Serge as it would between Frog and “another” him. Admittedly, some of the characters in Cross feel like filler such as NeoFio, a flower child I recruited and never used again. There’s also Leena, who is your childhood friend and seems mostly the same in both timelines. But many have very poignant stories that differ in the alternate histories, which is where Cross’s strength really lies. There’s Zappa who, in the home world, has lost his son, Karsh, and his business is failing. In the alternate history, he’s a successful blacksmith. Karsh himself has very different fates in the two timelines, being dead in one, and a conflicted warrior in another, haunted by his past deeds. In another father/son relationship, Gogh has become a struggling painter in one universe and a trader in another to support his son, Van. Ironically, by becoming a trader focused on making money, the two are estranged even though life is comfortable for both. The conflicting pursuit of becoming an artist versus being practical and garnering wealth achieves expression in their widely differing lives. But Serge and company find out from the maid that Gogh still collects paintings, secretly longing after the creative dream he gave up long ago. Regrets abound for many of the characters and there are several ghosts in Chrono Cross, both figurative and literal. The protagonists of Chrono Trigger act as a sort of Greek chorus, informing Serge and company about events in their past from the background, but never taking over. It’s a fitting symbol for Trigger’s relationship to Cross. After you recruit Greco, he realizes he is hiding from living life after killing his friend, Ghetz, and agrees to come to protect Serge from the darkness. Later in the game, Greco is confronted by Ghetz’s ghost. But rather than accuse and convict him, Ghetz teaches him his final technique, GraveDigger, while also telling him his sorrow will fade. Is it a coincidence that Greco’s most powerful move is tied hand in hand with a moment of reconciliation and forgiveness? Chrono Cross’s repeated themes of healing in the face of mortality seems to suggest not. In Chrono Trigger, I felt guilty that I caused the extinction of the reptite species (I know in the DS version, a whole village of reptites actually survived and some may argue they were doomed anyway from Lavos). In Cross, Kid gets poisoned by Lynx and the only way to save her is to get the Hydra Humour, a medicine that comes from the Hydra. The only problem is in “Another World,” the Hydras have gone extinct, wiped out by humans. In the normal world, there is only one Hydra left in the Hydra Marshes. A group of dwarves protect the last Hydra, knowing their survival depends on her. The Hydra’s physiology purifies the water in the Marshes, which is why her death means life in the surroundings will end. The dwarves fight to protect her, but are no match for Serge and company. Neither is the Hydra. The question arises; is Kid’s life more important than all of those who live in the Marshes? That’s the kind of moral dilemma that continually recurs throughout the game. In Chrono Trigger, there were moments where you might question your acts, but for the most part, you were almost always on the side of right. Not so in Cross. The ambiguities make the game so fascinating, especially when viewed through the skewed prism of “another world.” In what is supposed to be a somewhat hopeful ending, it’s revealed the Hydra is pregnant. But I could only think about this lone hydra baby and the bleak fate that awaits it without its mother. The sister of one of the playable characters, Rosetta, dies from her wounds and your entire party is banned from ever entering the village again since you caused the dwarves to attack in the first place. To make matters worse, I later found out through a FAQ that if you didn’t actually try to save Kid by getting the Hydra Humour, someone else passing through would give her the serum. I can’t imagine any alternate history where my actions could be justified. I wasn’t a hero. My death might have been a good thing. The battle system essentially perfects turn based combat with a stamina bar that creates tense, fast-paced battles, and all this to one of the most catchiest tracks in any JRPG. I love the fact that you can escape any battle, and that not only includes bosses, but its’ final boss, the Time Devourer. When battles are completed, you have the option of healing your party members automatically without using consumable items. Enemies are also visible on the map so you can avoid random combat. The elemental system is a thing of beauty, adding a strategic element that verges on poetry in the final climactic, “Chrono Cross,” to beat the whole game. One of the most powerful battles starts the second act. You face your archvillain Lynx, whose visual style is inspired by the Aztec god of fate, black magic, and chaos. Just as you think you have defeated him, he swaps bodies with Serge. It’s another “cross” that changes the flow of the game in a completely unexpected way and is somewhat reminiscent of the John Woo film, Face/Off. Like the film, it opens another dimension to your humanity when you realize how it is that people treat non-humans. “The only thing pure in this world is enmity,” the new Dark Serge states. You wake up in what looks like a Vincent Van Gogh painting. The art is impressionistic, a revisualization of the world you thought you knew. And in what seems a recurring motif, it’s Crono from Chrono Trigger who reveals that Lynx is actually your father, Wazuki, corrupted by the super computer FATE. You swapped roles with your father so that the inter-dimensionality takes on another layer of complexity in a multi-generational jump. The philosophical implications are fascinating to ponder as well. Constantly, you are accused of your father’s sins (e.g. the dragoon, Radius challenging you to combat), even though you are trying to weave your own destiny (Radius acknowledges there is no malice in your attacks and ends up joining you). Part of the redemption lies in undoing Lynx’s actions by becoming him and then reclaiming your own identity after a long struggle. It’s only in a warped atonement that you can find your self again, but that’s the only way to become the “master of two worlds” and to right the many wrongs executed over the ages. Just as Serge freed himself, I’m no longer bound by the ghost of Chrono Trigger, instead, able to take Chrono Cross for its individual brilliance. In any alternate dimension, that’s a good thing.